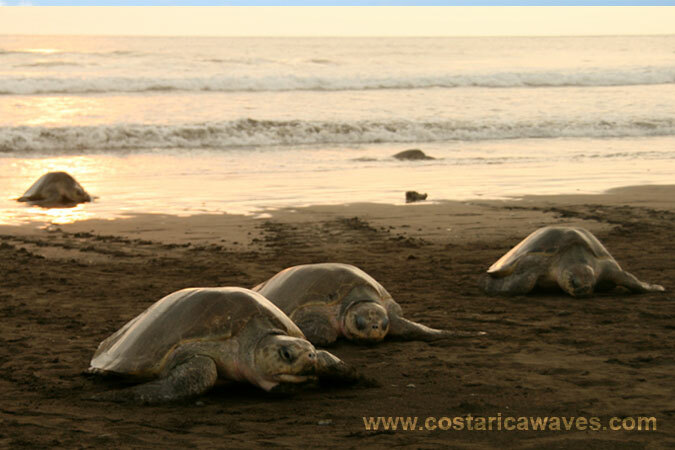 This beach is not only well known amongst surfers, it is a popular location to observe the sea turtles. The turtles come year around to this protected nesting area, but at certain times they come in masses. During those periods surfing is not allowed! Even in the dry season one should drive here with a 4x4 with some clearance. Especially when you are coming from the North there are some rivers to cross. The roads in this area are all gravel roads. The bottom is sandy and the waves break to the left and to the right. This spot is best surfed on mid to high tide. The swell has to come from the North or the Northwest. From December till March the surfing conditions are the best. 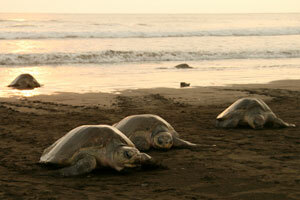 Olive Ridley Turtles at Playa Ostional.